If you’re a carwash attendant or owner, you know how important the right accessories are to fulfilling a productive and successful business day. Whether your clients pull up in a minivan or a brand new sports car, all of your customers expect their cars to emerge out of your carwash sparkling clean. What better way to ensure positive reviews and a satisfactory experience than with high-quality soaps, waxes — and towels, of course. After you’re done sprucing up a client’s vehicle, you can’t let them drive off your property a soaking or dripping mess. While you require a cleaner that stands up to the job, you need a trusted towel that can perform, too. As a carwash owner, you need your accessories to stand up to the job at hand and outperform expectations. You use towels on a regular basis and shouldn’t have to settle for a subpar product when their job is so essential in your business. At Towel Super Center, we offer the best durable, quick-wicking towels for your car washing necessities. Our premium wholesale white hand towels are made with a cotton-poly blend. Cotton and polyester are two fabrics that on their own are fantastic materials. But when they’re blended, you get to enjoy the optimal fabric composition by enjoying two amazing materials packed into one. Polyester is a thirsty material. In an industry that works with water continuously, you need a towel that can absorb effectively and efficiently. Fortunately, cotton is known for its ability to sponge up liquids as well. What’s the end result of two ultra-absorbent materials? A towel that professionally dries your clients’ cars, ensuring they drive off the lot with a sparkly sheen instead of a damp, dripping mess. There’s a reason cotton is the number one choice across industries. It’s not only absorbent and quick-drying, but it also provides fluffy softness that feels great against your skin. Polyester is also a go-to fabric due to its ability to withstand constant wear while remaining strong and durable in the process. Buy towels that not only your clients will love, but your employees, too. After sprucing up cars and trucks with an added wax or cleaning, they need a towel that helps them finish off the job perfectly. When they grab our premium white poly-cotton blend hand towels, they’ll be met with plush softness while knowing they have a trusted sidekick that won’t tear or fray while completing the job. You’ve searched the market and scoured the internet for the perfect wholesale white hand towel for your business. If you’re looking for the best fit for you, then you’ve arrived at the right place. 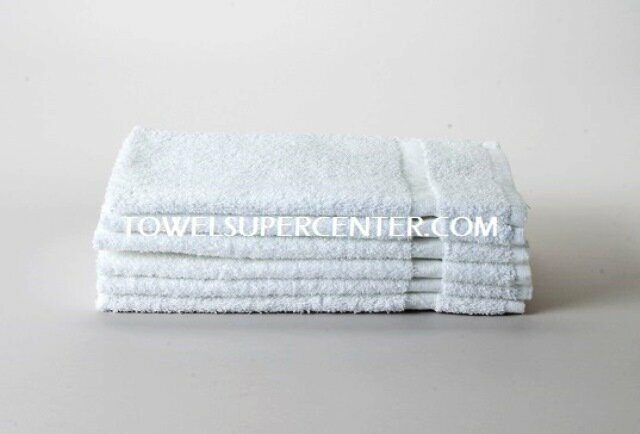 Towel Super Center offers a variety of sizes, dimensions and materials to best fulfill your industry’s drying necessities. What’s better than an amazing product that performs with softness and strength? Low-cost affordable prices. Our rates are available to you at a low, per-towel rate, ensuring your carwash buys quality towels without draining your company’s expenses.